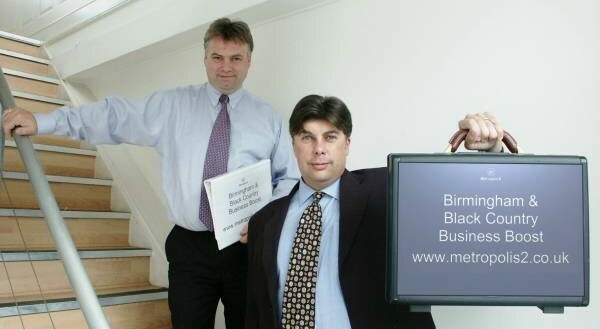 Directors James Manning (with briefcase) and David Price announce launch of the 4Bs - Birmingham and Black Country Business Boost. The 4B's initiative is targeted at supporting the region's businesses. James Manning explains: "There are organisations in the region who could further enhance their opportunities to do business if they maximised their marketing potential, but they shy away from agencies for a number of reasons, not least cost. We are keen to see businesses in this region succeed and with that in mind we are introducing the 4Bs - Birmingham and Black Country Business Boost. We will meet with any business in the region and analyse the challenges facing them and discuss possible solutions. We shall be able to take a fresh, objective look at these businesses because we shall not be shackled by internal politics or historical baggage. Given the increasingly fierce pace of business we expect that the meeting should take no more than an hour, and we won't charge for the meeting." So what’s in it for Metropolis 2? "Maybe nothing," says James. "It’s perfectly possible that the businesses we meet may simply take some of our ideas and pass them on to someone within the business to action them or they may do nothing. Frankly, we would rather they did the former so at least we would feel that we had made some contribution toward boosting their success. It is possible that the only exposure some of these companies may have had to agencies is on the receiving end of a new business director's hard-selling phone call. This time their exposure should prove much more rewarding for them, and at up to 60 minutes it could be shorter than the new business call." Any company wanting to benefit from the 4Bs initiative can contact James Manning or David Price via email on businessboost@metropolis2.co.uk or on 0121 236 6116.